Visiting a local market can be a fun cultural experience. Over the past six months we have spent many hours shopping for food in local markets. Although our grocery list does tend to have the same core ingredients regardless of where we are, we have found that the options available can vary in every city and country. We spent two weeks touring New Zealand in RVs with 12 friends from home. On arrival, we went to the local grocery store to stock up on some basics to allow us to make breakfast, lunch and a few dinners in the comfort of our RVs. In preparation for the visit, I had made a first pass at creating a grocery list, which we reviewed and revised on the way to the store. We divided the list into three parts and set out to fill our carts. We had no issues filling four carts, and gained a lot of funny looks along the way. Shopping for 14 is far different than shopping for 2! There were a number of things from the shopping experience that collectively surprised our group. Among those was the lack of availability of turkey meat. Granted, we eat turkey a lot in the US. I mean we have a holiday nicknamed “turkey day” where our custom is to eat turkey. Turkey tends to be the lunch meat of choice. Likewise, our stores offer ground turkey meat as an healthier lower fat alternative to ground beef. However, what we learned is that you will not find turkey in stores in New Zealand. Neither the deli nor the pre-packaged lunch meat carry turkey as an option. Over the course of the next five weeks, I found myself browsing the deli and pre-packed meat isles in New Zealand to find turkey. However, there was no turkey to be found. The primary deli meat available was ham in every flavor and style. They did have roast beef and roasted chicken but the selection was limited and the price of the chicken was far more expensive. On our arrival in Melbourne, I was so excited to see turkey at the deli counter that I almost ordered some without considering the price. Luckily, Kevin stopped me in my tracks when he spotted the price. Sliced turkey from the deli counter at the store cost $28.00 (AUD) per kilo. That equates to roughly $14 (US) per pound! Yikes! For that price, I can wait until we are back state side to have a turkey sandwich! 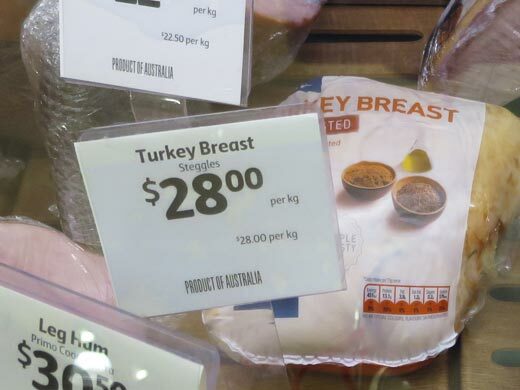 Turkey in Australia is difficult to find and expensive. Not only is the turkey expensive in the South Pacific (if available at all), but we have noticed that all meat seems to have a premium price. It could be where we are shopping, but it seems that we have things pretty good in the US when it comes to the cost of many foods. For example, we have found ground beef generally costs well north of $5 per pound. Likewise, chicken breasts cost more than $9 per pound. Many sliced meats from the deli, such as ham or roast beef are commonly over $7 per pound. The high prices haven’t caused us to give up meat in our daily diet just yet—although I did become a vegetarian for a week while we were in China, but that’s a different story. We definitely have a new found appreciation for the availability and lower costs that we tend to enjoy at home. Our phones don't work in most places, so email is your best bet! We'll pick up SIM cards periodically within some countries and will post our local phone number here if applicable.